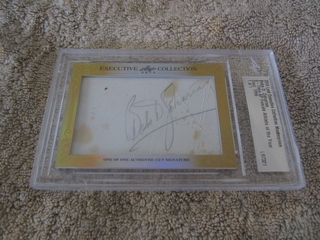 Leaf Executive Collection Masterpiece Cut Signature cards feature certified autographs of athletes and celebrities of every sport, genre and era. These are unique 1/1 cards that are slabbed by Beckett Grading Services (Babe Didrikson Zaharias 2015 Leaf Masterpiece Cut Signature #1/1 card shown at right). A maximum of one Masterpiece 1/1 card of each athlete or celebrity is produced by Leaf each year. AutographsForSale.com offers the largest selection of Leaf Masterpiece Cut Signature 1/1 cards anywhere (below is just a small sampling of our inventory -- we have several hundred more not listed, just ask).